The Glentoran v Ards and Knockbreda v Annagh Utd matches in Saturday's Irish Cup fifth round have been postponed due of waterlogged pitches. The decision to call off the fixtures was taken following heavy rain on Saturday morning. Glentoran's game with Ards at the Oval has been rearranged for Tuesday, 19 January at 19:45 GMT. The remaining 14 fifth-round ties remain on at present, including Linfield taking on Ballymena United. 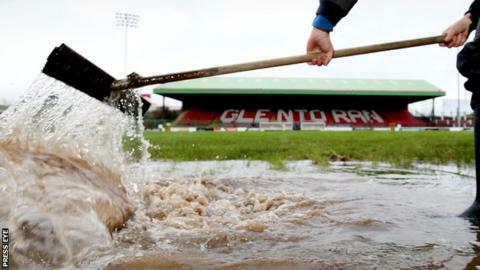 Glens fans and officials worked tirelessly on the pitch, which was flooded earlier this week after persistent rain. Despite their efforts a downpour just hours before kick-off resulted in the game against Championship One leaders Ards being postponed after a pitch inspection.